An anti-abortion demonstrator outside the U.S. Supreme Court in Washington, D.C., in March. Last month the high court struck down a Texas law that imposed tight regulations on abortion providers. For the past several years, anti-abortion groups have pushed an agenda aimed at imposing much stricter regulation on abortion facilities. The groups said it was to promote the health and safety of women; abortion-rights supporters said it was an effort to regulate the clinics out of existence. At least for now, the Supreme Court is siding with abortion-rights backers. 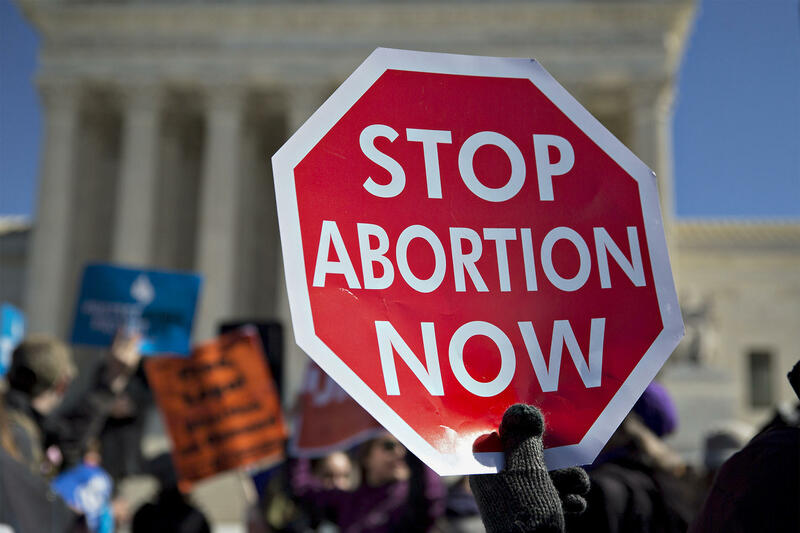 Neither of the portions of Texas' omnibus abortion law that were up for review "offers medical benefits sufficient to justify the burdens upon access that each imposes," wrote Justice Stephen Breyer in the court's majority opinion. The provisions that were struck down required abortion clinics in the state to meet the much higher safety standards for facilities that do much more advanced surgical procedures; the provisions also required doctors who perform abortions to have admitting privileges at a hospital within 30 miles of the clinic. In hindsight, "maybe it was a mistake for us to champion safeguards for women," said Marjorie Dannenfelser, president of the Susan B. Anthony List, whose goal is to elect more anti-abortion candidates to public office. "Maybe we shouldn't have done that." At a media briefing last week, Dannenfelser said her group will instead rally around legislation that has passed in more than a dozen states to ban abortion at roughly 20 weeks of pregnancy. Similar legislation passed the U.S. House but not the Senate. The 20-week ban is "our top priority," Dannenfelser said. But Clarke Forsythe, acting president and senior counsel for Americans United for Life, said his group plans no fundamental change in strategy. "It is more important than ever to focus on the risks to women and negative consequences," he said in an interview. "The justices can't sweep away the public health vacuum that they created with a few pen strokes." Forsythe said that while the high court's ruling has "put some roadblocks in the way, and we will have to take those into consideration," there are still plenty of opportunities to regulate abortion providers that could pass constitutional muster, particularly if they are more narrowly targeted than the Texas law was. The nation's oldest anti-abortion group, the National Right to Life Committee, has never embraced the push for health and safety regulations aimed at women. "Our focus has always been on the humanity of the unborn," said its president, Carol Tobias, rather than potential risks to women seeking abortions. Her group has instead been pushing state and federal bills to ban abortions after 20 weeks and also ban "dilation and evacuation" abortions, which are the most common procedure performed after the first trimester of pregnancy. "I don't think the Texas decision is necessarily going to impact those types of legislation, and I know it's not going to affect us," she said. But there is one thing all these anti-abortion groups seem to agree on: The future makeup of the Supreme Court — and the future of abortion rights — hang in the balance with the upcoming election. Because of the vacancy left by the death of Justice Antonin Scalia last winter, "it is so obvious, so simple to make the case" about the importance of who controls the White House and Senate when it comes to Supreme Court appointments, said Dannenfelser. "We say the court's always important," said Tobias. "But this time we have solid proof." The groups also agree on something else — that despite the recent decision by the Supreme Court, abortion-rights forces are not winning the fight. "The pro-life cause has never been stronger," said Dannenfelser. "And our opponents' position has never been weaker." Immediately after the court's ruling, said Tobias, "Planned Parenthood came out and said they were going to pass pro-abortion legislation and repeal pro-life legislation." That is true. "Today's victory means we can fight state by state, legislature by legislature, law by law, and restore women's access to reproductive health care," Dawn Laguens, executive vice president of the Planned Parenthood Action Fund, said in a written statement. But in fact, Tobias said, "they haven't been able to do that in 40 years. The only way they make advances is through the courts. They don't have the people" on their side. In an interview, Laguens agreed that her side has more work to do. "We've got to change hearts and minds," she said. But Laguens insists it is abortion opponents who are "out of sync with America and out of sync with the new generation." With a more "social justice minded" generation of millennials now coming of age, she said, foes of abortion are the ones on the defensive. "They're in a last-gasp moment," she said. "They feel it slipping away."